Caught this elderly gentleman as he was parking his bike to cross the street to the barber shop in Poulsbo. 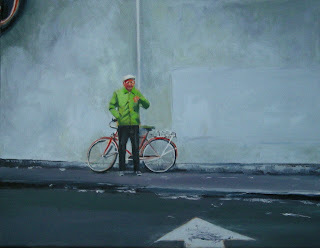 I don't know why he didn't just ride his bike to the other side of the street. Go figure. I'm having a hard time getting started on my Port Angeles material so I am posting this one till I get going again. 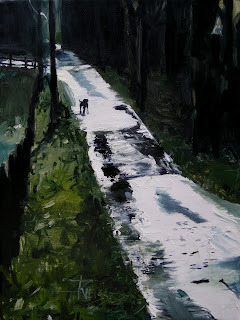 Guess I am having kind of a painters block right now. I'll get over it. Thanks for hanging in there with me. All week the weather "forecasters" predicted clear, sunny and warmer for the long weekend and for once they were right! I took advantage and headed out for one of my favorite beaches on the Washington coast, La Push. 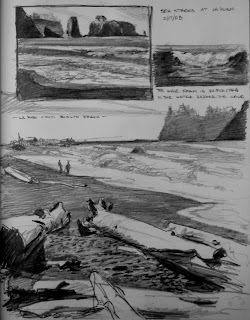 There are three great beaches in that area and I spent most of my time on Rialto beach. I did a lot of sketching so I could get the most work out of the time I had. These pencil drawings are all done on location. I did one oil painting which I will touch up in the studio and post later, with lots of painting to come from photos and sketches! 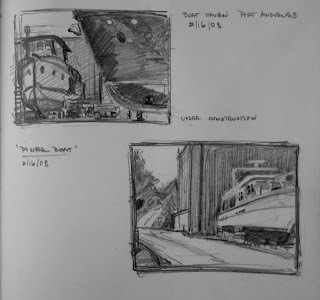 Port Angeles has so many great spots around the docks and shipyards that I stayed the night there and spent the whole day wandering and drawing and taking photos. I also found a great little seafood seller at the boat haven where I picked up some crab cakes to cook on the beach...yummmm. Salt creek is another favorite camping spot only about a half hour out of P.A. going west. I took a quick side trip up there and got a few more sketches. the camp ground was closed due to lots of trees down from winter storms. Looked like they got hit pretty bad. 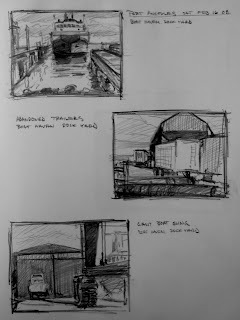 More sketches from the "Boat Haven" in Port Angeles. 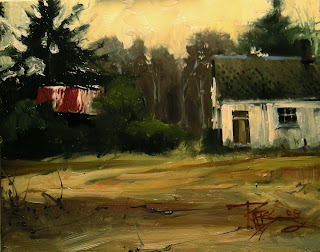 I love old buildings and old sheds falling down and overgrown. Something about the color and textures in old painted and weathered wood. These guys are getting plowed down by the hundreds around here in the great cycle of life and commerce. Out with the old and in with the new. It's fun to find them and save them at least on canvas. Got a little glare from the light in this photo, sorry about that. 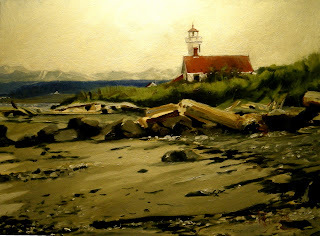 This is from our last visit to the Lighthouse at Fort Warden in Port Townsend. The day was blustery and cold. It felt good to get back to the woodstove at home. .. I could hear the dog barking but I couldn't see him when I stopped to take this shot up on the top of Sawdust Hill road. The sunglare off the pavement was so intense. I just pointed the camera out the window and snapped the picture not knowing what would come of it.